Out of all the small business websites in the world, the winners of a Bizignee blog award are simply the best – both in content and design. Each small business website that is nominated for the award is reviewed and judged based on the overall design of their website, as well as the value and creativity of the content they provide. For more info, click here. By the way, congrats to David at Mind Petals for winning won as well! Today I’m taking you into my home office to show you how I’ve set up shop. I work out of my room (like lots of college entrepreneurs), but I make the best of it. First a quick tour, then I’ll go into more detail on two projects you can implement for your home office. I’ve got a corner desk, with room for writing, working on the computer, and organizing my belongings. 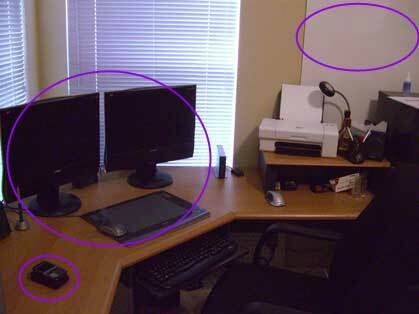 You’ll notice two monitors and a WACOM tablet – essential tools for a web developer. Under the desk you’ll find a dual core desktop – perfect for running photoshop, flash, and dreamweaver at the same time as I often do. I carry a laptop and my T-Mobile Dash everywhere I go, very convenient for staying in contact with my clients while on campus or around town.